How To Get Started With Your Instant Pot Pressure Cooker. After falling in love at first sight with our Instant Pot Pressure Cooker in 2016 we are sharing with you our words of wisdom. Lots of Instant Pot Hacks, top tips, tricks and the best ever Instant Pot recipes for beginners. Plus, much, much, more. Let me guess, you’ve arrived on this AMAZING Instant Pot food blog, because you want to know how to get started with your Instant Pot. You want to know all about the jargon, what to cook first in the Instant Pot and why so many people fail to ever get it out of the box. Well I am here to share with you everything I have learnt about the Instant Pot. From when it first arrived in our kitchen on that cold November afternoon, to how we discovered which Instant Pot Accessories worked for us and what Instant Pot recipes are the easiest for beginners just starting out. Can I say that it starts with getting it out of the box? As so many people don’t. They are the generation that remembers manual stove top pressure cookers exploding and are genuinely frightened of anything pressure cooker. They are also the people that got their Instant Pot gifted to them and never had any plans to learn about Instant Pots and now wonder what on earth to do with it. Well, in my opinion, it is no worse than when you got your first slow cooker or your first microwave. There are new things to learn and cooking is slightly different to the oven, but you soon get your head around it and realise just how delicious Instant Pot cooking can be. It also reminds me that I MUST make yoghurt soon as I have had it so long and it seems a waste not to have made a single portion of yoghurt in it! Do The Instant Pot Water Test! The next thing on the list after getting it swiftly out of the box is to do the famous water test. Basically, the water test is cooking some water at pressure to make sure your Instant Pot is working properly. It takes a minute if that, yet it freaks a lot of newbies out, when they first get the Instant Pot. Think of it like when you have your hair coloured. You go and do a patch test to make sure you’re not allergic to the colour. You can skip this, but there will always be a risk that it will go wrong. Then comes the famous Instant Pot Accessories. Lots and lots of people will be telling you that you need several different items and you won’t know who to listen to. As well as this I would recommend a spare sealing ring as you don’t want to be left without yours working and having to wait for a new one to be delivered. Here is the bundle I recommend as it’s a great starter kit for the Instant Pot and gets things going. As well as this we have an extensive Instant Pot Accessories guide here for you to read. My advice to you, is to think about the kind of food you plan to cook in the Instant Pot and plan your accessories around this. Next on the list is your reading material. Aka our Instant Pot Pressure Cooker Ebooks. We have a couple to choose from and they are both fantastic reads. One of them covers our top 101 Instant Pot Recipes for beginners that covers a lot of the basics including a more in depth look at the water test. The recipes also includes everything from vegetables to pasta to rice to meat to fish. We cook a LOT of recipes from our Instant Pot Beginners recipes every day. As well as this we also have our Instant Pot archives. Where you can download into ebook format all our recipes that we have for the Instant Pot. You can also upgrade and get updates for life. Instant Pot Freezer Meals is our latest addition to our ebooks collection. It teaches you how to make 15 frugal Instant Pot meals in 2.5 hours and is our favourite product so far. It is hard to drill down, when you have 100+ Instant Pot recipes and choose just 20 BUT we did it and these below are our all-time favourite Instant Pot recipes, especially for the beginner. But you don’t have to have the Instant Pot brand for them to work for you. They can also be used with the Power Pressure Cooker, King Pro Pressure Cooker or a different sized Instant Pot. For reference, we have both the 6 litre and the 8 litre Instant Pot Pressure Cooker. If we could choose just one to use it would be the 8 litre. The first ever vegetable I cooked in the Instant Pot and in my opinion, the nicest. It is quick to cook at just 2 minutes and perfect on the side of your meat or fish. You can also cook fish at the same time. An early recipe for us to make in the Instant Pot and so much quicker than how long it takes with more traditional methods. If you love bangers and mash, then cook the potatoes in the Instant Pot and the sausages in the air fryer. If you love baked potatoes but hate the fact that you have to wait hours and hours for them in the oven, then you will love Instant Pot Baked Potatoes. A true genius of the Instant Pot for speed. Do you want to cook something easy, beyond potatoes and veg? then you need to make soup. Instant Pot Cheeseburger Soup is delicious and one of my favourites. I just wish I made it for frequently. I am hooked on potato corn chowder in the Instant Pot Pressure Cooker. This is because it makes a lazy dinner for when I can’t be bothered to cook. You throw all the ingredients into the pressure cooker and then you have a warming comforting winter soup in 5 MINUTES. 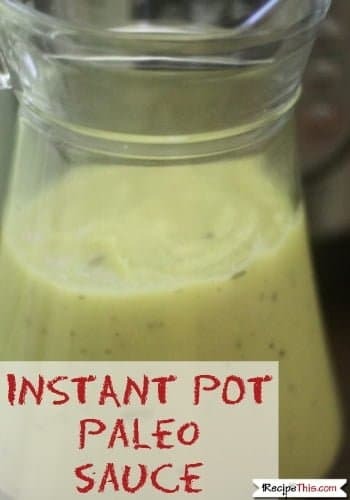 For the health-conscious person, I love paleo sauce in the Instant Pot. It takes just a few minutes and then you have a healthy sauce you can use for everything. It can replace your cheese sauce, white wine sauce, peppercorn sauce and so on. We freeze it into small little portions and then grab one when we need it. It also cooks very easily from frozen in the Instant Pot. Want to be healthy and avoid processed foods? Get sick of every recipe calling for cream of mushroom soup? Well this is how to make your own homemade version in the Instant Pot. Freeze it for later for whenever a recipe calls for a can of mushroom soup. Another classic beginner recipe in the Instant Pot is boiled eggs. They taste so good, are perfectly cooked and so easy to peel. A pork roast in the Instant Pot is delicious. The pork is tender, and you can’t stop on just one slice of it. I am guilty of going back for seconds and thirds. Your pork roast can be cooked from frozen, bulked up and you could also cook a pork roast dinner together in the Instant Pot if you wanted to. You can also make the American classic of meatloaf in the Instant Pot too. I have done so several times and each time it has turned out perfectly. It is also much quicker than cooking it in the oven. I love that the Instant Pot can make all your cheap cuts of meat taste tender. Beef shin is a wonderful example of this. We have beef shin in the Instant Pot whenever we get some clearance beef shin. Sadly, that is not as often as we would like. I also love our beef stew scraps in the Instant Pot. It works by putting together all those super cheap cuts of beef and cooking them in the Instant Pot, until you have a tender stew. It’s the best part of the Instant Pot and why its such a big money saver. A classic old school recipe, you will love our Instant Pot makeover of beef tips and mash. It also comes with its own gravy made from the beef stock. We love to have beef tips for a mid-week dinner with the kids. Instant Pot Rotisserie Chicken is a recipe worth trying. It can be done from fresh or frozen whole chickens and is so good. You can also mass cook them and then shred the chicken for meal prep or freezer meals. We have rotisserie chicken mainly when we have forgotten to get some meat out for dinner! I have a HUGE sweet tooth and I can’t turn down chocolate lava cake. If you are unsure of times or want to do a fool proof version, then you will love our Instant Pot Chocolate Lava Cake. Out of all the cheesecakes my favourite is strawberry. Here is how I make perfect cheesecake in the Instant Pot. It is all beginner friendly as I started making it when I had only owned my Instant Pot 1-2 months. I love making popcorn in the Instant Pot and it is so easy. It pops away for you quickly and efficiently and then just load it up with your favourite seasonings. I love adding to mine cheese, salt or just caramel. If you love rice pudding and caramel, then let me introduce you to my Instant Pot Caramel Rice Pudding. Super delicious and you will want to eat this every night after dinner once you try it. As well as these we also have some more Instant Pot recipes featured below in our useful reads section. Beyond our all-time favourite beginner Instant Pot recipes, we also have a few other excellent reads to help you get started with your Instant Pot. I also wanted to share with you some awesome Instant Pot Hacks. Just to give you a head start with your Instant Pot. Information I wish I had known before I got my Instant Pot and to have given me peace of mind. It always feels like these Instant Pots and other pressure cookers are constantly changing their designs. A bit like when you go to the supermarket and it annoys you when they change their layout. My Instant Pot says manual, but many of the younger versions now call it pressure cook. Other brands also call it pressure cook or something similar, so remember this when a recipe calls for a button you don’t have. You also don’t need to use all these different buttons, just what makes you feel comfortable. You read an Instant Pot Accessories post on Google and it calls for a 7 inch spring form pan. This is standard for the 6 litre or 6 quart. Yet if you have the 8 litre you’d want an 8 inch or go even smaller for the Instant Pot mini. It is best to measure your Instant Pot with your own baking dishes before you go out and buy accessories as you don’t want to get the wrong size. The sauté setting on the Instant Pot reminds me of how hot an electric hob gets, and it stays that hot. Unlike when you use gas hobs at home, it normally cools quicker. If you’re not used to cooking with electric bare this in mind. Sometimes I take the inner pot out, as the food is just cooking too fast on sauté. There is a lot of different kitchen gadgets that we found that the Instant Pot replaces. If you’re on the fence and think the Instant Pot takes up a lot of room. Then imagine it after a clear out once you have got rid of a lot of your stuff. Though out of those replacements above, well love it the most as a plan B for the steamer. Those 3 in one steamers, take up so much room, but that is no longer a problem. Forget making freezer meals in the slow cooker, the Instant Pot is the new gadget on the block! I made more than 15 freezer meals in 2.5 hours for the Instant Pot and it amazed me with its capabilities. The Instant Pot is fantastic for healthy cooking. You can steam broccoli, quickly cook shredded chicken from frozen and make the most delicious warming beef stew. BUT it can also make cheesecake, turn condensed milk into naughty caramel. I would never call the Instant Pot a healthy eating gadget, more a gadget for saving time and money. It is just up to you whether that means eating healthy or unhealthily. You have an inner pot for your Instant Pot that goes directly inside the main shell of the Instant Pot. You must cook your food in this. If you don’t its like cooking in the oven without an oven shelf or a dish and is heading for disaster and you’re likely to break it. I get that accidents happen, and we sometimes forget. If this happens, I recommend you remove it from electricity straight away, remove everything you put in it and wait for it to dry out and hope for the best. When we took it camping last summer our 1 year old kept pouring his milk into it, but it wasn’t turned on, so the damage was reversable. If you damage the inner pot, you can buy a new one on Amazon. It’s a bit like when you damage your television. You can replace little bits of it, and it will be as good as new, without having to start again with your Instant Pot. Many Instant Pot readers of ours have replaced their Instant Pot inner pot and their sealing ring. When you pressure cook in the Instant Pot you hardly need any liquid at all. The average recipe, even when steaming food in the Instant Pot, requires just 250ml of water (1 cup). Some recipes require slightly less but this is the comment amount. You can also replace water with tinned tomatoes in a lot of recipes too, which is how I prefer to cook Instant Pot Frozen Shredded Chicken. But note the more liquid used the longer it takes for the Instant Pot to go to pressure. Whatever you do, don’t send the Instant Pot to pressure with a lot of milk. It will explode as soon as you open it, will often burn and will become your Instant Pot recipe from hell. Instead if you need to use milk add it later. I find that a small amount of coconut milk is fine during cooking though as a plan B. There is a lot of Instant Pot jargon that you often see being used. We have a complete list of the Instant Pot Terminology here for you to get your head around it all. After you have finished sautéing your meat or fish, it is important to deglaze the pot. This allows the pot to clean the sticky stuff from the bottom and prevents the Instant Pot burn warning from coming up. Back to point #3 it gets very hot after a sauté and adding liquid and scraping the bottom stops it from burning your food. I often do this with some wine, coconut milk or a can of tinned tomatoes. When you start using the Instant Pot, what you don’t realise is how long it takes to come to pressure. That recipe that takes 20 minutes to cook is really 30 minutes thanks to taking 10 minutes to pressure up. The time for food to come to pressure can vary a lot between recipes, BUT I have found that the average food takes 8 minutes and when the Instant Pot is very full it can go up to 20 minutes. I often cook from frozen in my Instant Pot Pressure Cooker. But there is the 20% rule to take into account. Always add on 20% of cooking time to adjust for cooking frozen food. This is for when you want to cook your favourite fish, meat or freezer food directly from the freezer. If it would normally take 10 minutes, then add an extra 2 minutes or an extra 4 minutes for a 20-minute recipe and so on. BUT frozen vegetables work the opposite because they have already been blanched prior to being frozen. With frozen vegetables I always divide it by 2-3. My favourite broccoli now takes 0 minutes instead of 2 minutes and cauliflower can drop from 3 minutes to 0 minutes. This must be the scariest thing for new Instant Pot users. How can you have chicken breasts with a 100 different cook times, among 100 different food blogs? Well it happens and each of them all claim theirs is the right way. MINE IS CORRECT OF COURSE! The same can be said for eggs, meat, fish, cheesecake and so on. I just recommend that you try out a few and see which works for you and practice on cheap food. You don’t want to ruin fillet steak or lobster. Some Instant Pot recipes will work perfectly for you and others will be terrible. You can also follow a recipe to the letter, but because yours took longer to go to pressure, or you used different food quantities, it can alter the end result. I just suggest that you practice some trial and error and then go with your favourite Instant Pot recipes that you have developed over time. I am a huge money saving fan. I get my kids Christmas presents during Black Friday or through Facebook Groups. The husband said I am tight, but I just say that I am good with money. The Instant Pot is a perfect example of that. Not only can you always grab one during the sales for less money, but it shouts out money saving dream. You can bulk cook meals using clearance food, make your own jam, make your own yoghurt, reheat your leftovers and so much more. I would estimate that the average family, if you cook with it daily could reduce their grocery bill by 30%, if not more. Our own grocery bill compared to when we got our first Instant Pot in 2016 is down by 45%. During the summer of 2018, I wanted to prove that you could have an amazing holiday on a budget. We stayed in 8 different European countries in one summer. Our Instant Pot came with us and did the bulk of the cooking. It did us proud and allowed us to keep our budget down too. It got used in hotel rooms, campsites and in my aunt’s kitchen. Let’s just say she had never seen one before and fell in love. Think of the slow cooker function on the Instant Pot as triple as slow on your regular slow cooker. Its okay if it was something that doesn’t take long, that you want to leave overnight, buts that’s it. BUT I love the slow cooker setting on the Instant Pot for keeping my food warm. When you cook food in the Instant Pot, because of the pressure it can reduce flavour. This means that’s its important to taste your food before serving, then adjust with extra salt and pepper at the end if needed. Also, if cooking with wine it dilutes it, so add a little extra.